You have joined a community of 300,000 people all over the world who are developing their communications, confidence and leadership skills. We know from experience that the more you put into this, the more you will get out of it, so let’s get started! Firstly, check out this video from Toastmasters International for new members! The educational program is the heart of every Toastmasters club. It provides members with a proven curriculum that develops communication and leadership skills one step at a time. It has many opportunities for awards and recognition along the way. The communication and leadership tracks are not mutually exclusive. You can participate in both at the same time, if you wish. You progress along each track by working through a series of manuals. Each manual offers a set of carefully crafted projects to complete. Each project includes an evaluation guide, which gives club members an easy way to provide immediate feedback as you complete the project. Competent Communicator Manual – the 10 speech projects in this manual will help you develop your speaking skills one step at a time. 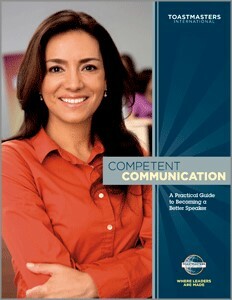 When you finish all of the projects, you are eligible for Competent Communicator (CC) recognition. Really eager to get started? You can find an electronic copy of the first speech project, the icebreaker, here. 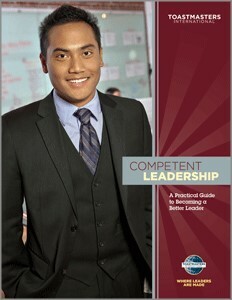 The Competent Leadership manual is the core of the leadership track. It features 10 projects, which you complete while serving in various club meeting roles. An evaluator will give you feedback on each project, helping you to improve. When you complete the manual, you are eligible for Competent Leader (CL) recognition. Your Speaking Voice – all about how you use vocal variety to add impact to your speech. You can download a copy of the manual: Your Speaking Voice here. Effective Evaluation. This is the magic ingredient behind Toastmasters. We all learn from each other because we learn to deliver great evaluations that not only highlight what we are good at, and are improving at, but also provides tips for getting even better. You can download a copy of Effective Evaluation here. As your club’s President or Vice President of Education to assign a mentor to you. They will guide you through your first few speeches and show you how things work in your club, and even beyond your club. You will benefit for having a mentor for sure, but they will too – its by supporting others that we become stronger communicators and leaders, and they can get credit themselves in the educational programme for acting as your mentor. We hope you’ve got the message! New to Toastmasters? Get started! You’ll be glad you did.